Max’s Proprietary RiboCeine™ Technology For The Ultimate Glutathione Enhancement . 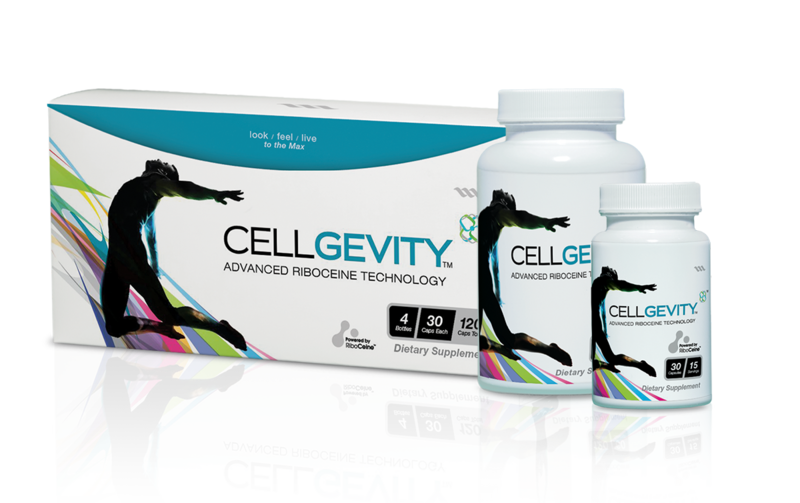 Backed by decades of reputable science and research, Cellgevity is a proprietary blend superbly balanced with prime ingredients cells utilize for superior function for better health. Features Max’s patented RiboCeine™ technology that promotes natural production of Glutathione, the body’s master antioxidant. Includes 12 other highly effective prime nutrients that provide additional cellular support for what cells need to naturally produce glutathione. Replenishes cells with what they need to produce glutathione for effective detoxification of harmful toxins and free radicals. I find Cellgevity to be incredibly useful in my day to day life. Not only do I have more energy to do my work, it plays a very supportive role in helping my body remove toxins. After going on Cellgevity I feel better than I have in years. I was not only able to drive 90 miles to work and hit the ground running, I am also able to enjoy a game of basketball with my daughter. Buy Cellgevity now and optimize cellular functions for the health you deserve. Alpha Lipoic Acid is a powerful endogenous antioxidant known to combat various forms of oxidative stress and to recycle other antioxidants. Together with glutathione, they protect the fat and water portions of the cells from different types of free radicals. Broccoli Seed Extract (sulforaphane glucosinolate) acts as a catalyst to boost antioxidant activity for as much as three days. Protects against DNA damaging electrophiles and helps cells neutralize toxins and carcinogens so they are eliminated from cells. It also helps to raise and replenish glutathione levels and induces the antioxidant enzymes used in the Phase II detoxification pathway. Turmeric Root Extract (Curcumin) is a potent antioxidant that fights free radicals and is known to reduce inflammation. Curcumin also induces Phase II enzymes that support the glutathione detoxification pathway. Resveratrol is an antioxidant found in high concentrations in grape skin, also found in wines, with higher concentrations in red wine verse white wine. Resveratrol is thought to account in a large part for the so called 'French Paradox'. The French Paradox - the findings that the rate of coronary heart disease in France was observed to be lower than in other countries with a similar risk factor - has been attributed to the consumption of red wine. Resveratrol is an antioxidant known to have cardio-protective properties. Grape Seed proanthocyanidines have antioxidant activity, as well as anti-inflammatory properties. Quercetin is a supporting flavonoid antioxidant that scavenges free radicals that can damage cells. Milk Thistle (silymarin) is a powerful antioxidant used to support a healthy liver by removing harmful toxins and heavy metals that are stored in the liver. Vitamin C is an exogenous antioxidant that is considered a network antioxidant and known to support the immune system. Selenomethionine (Selenium) is the essential catalytic component of the enzyme glutathione peroxidase (GPx) and is absolutely required for its function. Selenium is needed as selenomethionine for the antioxidant enzyme, glutathione peroxidase. The glutathione peroxidase enzyme is responsible for the detoxification of lipid peroxides, and glutathione is absolutely required to regenerate this enzyme. Cordyceps has been used as a Chinese medicine for centuries and has been valued for its activity in restoring energy, increasing stamina, promoting longevity and improving quality of life. Black Pepper (BioPerine) assists in the absorption of selenomethionine, vitamin C and curcumin (turmeric root). Aloe Extract has the most bio-active content of acemannan, the active ingredient in aloe. Aloe is known to support the immune system and has antioxidant functions.